Gareth Bale's late goal was not enough to save Wales from a 2-1 loss to Denmark which ended their UEFA Nations League promotion hopes. Bale and James Chester both missed fine chances with close-range headers to put the hosts in front, but Nicolai Jorgensen's finish from a slick counter-attack silenced the Cardiff City Stadium two minutes before the break on Friday night. Denmark were happy to soak up pressure after half-time but needed Kasper Schmeichel in superb form to keep out a perfectly struck Bale free-kick, before Martin Braithwaite looked to have put the game beyond doubt two minutes from time when volleying in from a throw-in. Within 60 seconds, Bale gave Wales a glimmer of hope by rounding Schmeichel and rolling into an empty net, but Denmark held on for a victory which ensures they win Group B4 ahead of Wales, and will be promoted ahead of the next Nations League in 2020. 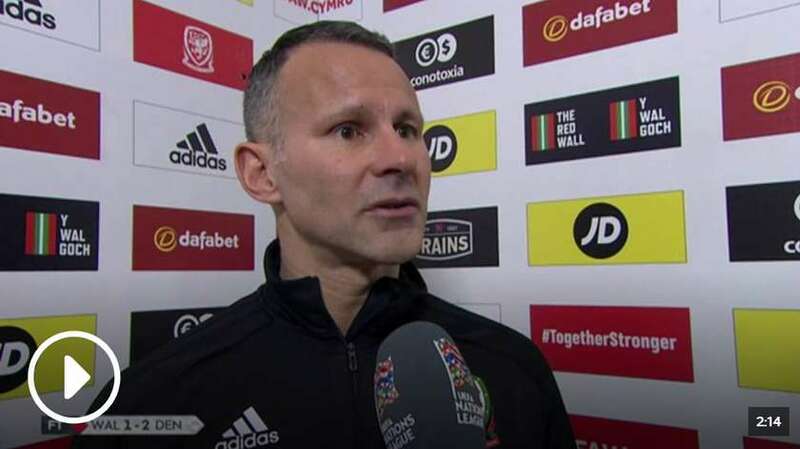 Wales boss Ryan Giggs believed his side did enough to earn a victory against Denmark but also praised the Danes' efficient performance as they beat Wales 2-1 in their Nations League match. With 'Land of my Fathers' still ringing in the ears of the Wales players, they took a while to settle but after Christian Eriksen's wake-up from a fizzing sighter which only just passed Wayne Hennessey's post, they sprung to life. Chester headed a glorious cross from Bale wide of the far post, before firing another chance over from a Brooks corner when unmarked. One man you did not expect to pass up an opportunity was Bale himself, but he too was guilty of a poor miss when nodding another Brooks delivery just wide of the post when it appeared easier to score. Denmark came back into the game as half-time approached, and after Wales were given a let-off when Braithwaite was wrongly ruled offside before scoring, there was no flag as the visitors mounted a slick counter-attack, with Yussuf Poulson's first-time flicked pass playing Jorgensen through, and after beating Chester in a footrace he slotted beyond Hennessey. Wales made three changes from the side that won in Ireland last month, including leaving Harry Wilson on the bench and recalling Aaron Ramsey. There were only three Denmark players in the side that beat Austria in a friendly last-time out, with Christian Eriksen captaining the side. After half-time, chances were more at a premium for both sides, but with Bale on the pitch Wales were always dangerous. When the Real Madrid star gave it his best with a wonderfully struck free-kick from the right, he found Schmeichel in similarly impressive form to tip his effort behind. Within minutes Denmark appeared to have mounted an unassailable lead, as Ethan Ampadu was slow to react when Braithwaite took a flick-on from a throw-in on his chest before volleying beyond a stranded Hennessey. But less than 60 seconds later Bale did get the better of Schmeichel to offer Wales a glimmer of hope from Williams' through-ball from inside his own half, although it would prove their last chance - and ensure they will remain in their group for the next iteration of the Nations League. Wales have now lost two of their last three competitive matches at the Cardiff City Stadium (W1); they had only suffered two defeats in their previous 14 such games at the ground prior to this. Wales have lost back-to-back home games in all competitions for the first time since September 2012, when they lost three in succession. Wales have conceded as many goals in their last four international games (eight) as they had in their previous 13 combined. Gareth Bale has been directly involved in seven goals in his five appearances for Wales in 2018 (five goals, two assists). There were just 84 seconds between Martin Braithwaite putting Denmark 2-0 ahead and Gareth Bale pulling one back for Wales. Nicolai Jørgensen's goal was his first for Denmark in over a year since he netted in a World Cup qualifying match against Poland in September 2018, 441 days ago. Brooks made more key passes than anyone else on the pitch (4) and is fast becoming one of Wales' most important players, just eight games into what is increasingly looking likely to be a long international career. His delivery from wide on the right was outstanding, and Denmark's defenders' attempts to stop him when he turned on the pace mostly ended in defeat. To upstage Bale is impressive in itself, but the 21-year-old was outstanding. Wales: Hennessey (6), Roberts (7), Chester (5), Williams (6), Dummett (6), Allen (7), Ramsey (5), Tom Lawrence (7), Brooks (8), Tyler Roberts (5), Bale (7). Subs: Gunter (7), Ampadu (5), Wilson (6). Denmark: Schmeichel (7), Dalsgaard (6), Christensen (7), Zanka (6), Larsen (5), Delaney (7), Schone (6), Poulsen (7), Eriksen (6), Braithwaite (7), Jorgensen (7). Subs: Dolberg (5), Lerager (6). Denmark play a dead rubber against Ireland in their final Nations League game on Monday, knowing they have been promoted already and Ireland consigned to relegation. You can watch that game live on Sky Sports Main Event from 7.30pm.